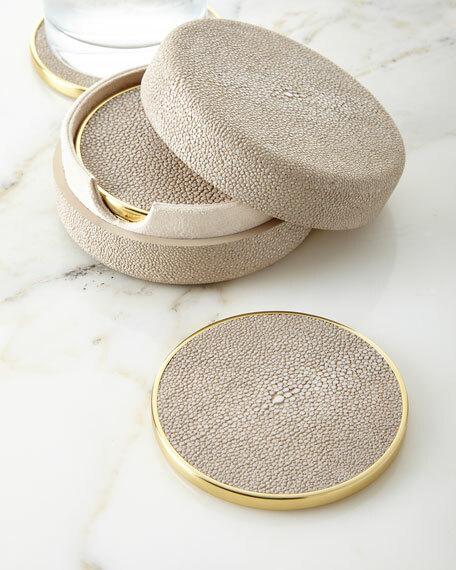 Handcrafted faux-shagreen (embossed resin) coasters with brass hardware. Set of four with holder. Set of four assorted ice cream coasters. Embellished with glass and plastic beads. Cotton backing. 6"Dia. x 0.2"T. Spot clean. Set of four assorted ice cream coasters. Embellished with glass and plastic beads. Cotton backing. 6"Dia. x 0.2"T. Spot clean. Imported. Set of four assorted emoji coasters. Embellished with glass and plastic beads. Metal trimming. Cotton backing. 4.75"Dia. x 0.2"T. Spot clean. Imported.